This newsletter is being resent due to a technical glitch in the RSVP email address in the previous version. We apologize for the inconvenience. Whereas other a cappella groups rely on technical implements and effects, vocaldente remain true to their pure and acoustic presentation of vocal art. 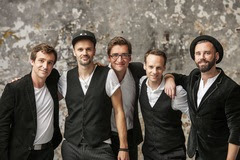 vocaldente are Tobias Kiel und Jakob Buch (tenors), Benjamin Boresch (countertenor), Alexander Nolte (baritone) and Tobias Pasternack (bass). Awarded with several of the most renowned international prizes they tour the world and don ́t shy away from any challenges. Be it tropical climate in New Delhi or freezing temperatures in the Sokolniki Park in Moscow: vocaldente provide an exciting insight into their turbulent life on the plane, the train or on the tour bus with their current program: 'Life is a Highway’! Their repertoire bursts all limits in variety: it covers genres from Charleston, Rock ́n Roll, Disco music to New Metal, Rap or Bollywood songs. For more than 10 years the quintet has been enthralling audiences all over the world with touching harmonies, ingenious arrangements, charming spoken interludes and their perfection in blending and singing performance. vocaldente are pure, authentic – and great fun! *Limited seating. RSVPs will be confirmed in the order they are received. *Please bring photo ID. Please allow time for the mandatory security screening process required to enter Embassy grounds.